Pre-owned, in UNWORN NEW CONDITION, with original box & papers. 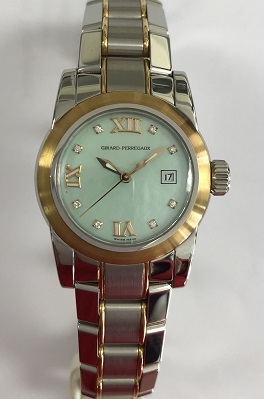 18K gold and stainless steel case, 29mm case, beautiful rare green color Mother of Pearl Diamond Dial, automatic movement, with date, and screw down crown. Retail new 10,800. OUR PRICE 6900 dlrs. Excellent Buy! To purchase this watch CALL US 956.687.2981.